All rotors should either be resurfaced or replaced prior to installing new pads or shoes to ensure a smooth and parallel mating surface. Brake rotors are disc-shaped brake system components mounted to either the wheel hub assembly or onto the spindle. They function by transferring friction into torque. Rotors are used to slow your vehicle. The brake rotor fastens via a flange arranged parallel to the braking surface to the integral wheel hub assembly or onto the spindle in older applications where the wheel bearings are part of the rotor. The rotor revolves with the road wheel at the exact rotational speed of the wheel. The rotor friction surface passes through the middle of the U-shaped brake caliper. The caliper contains the brake pads, which when the brakes are actuated meet both the inner and outer friction surfaces of the brake rotor at the same time, forming a clamping load on the rotor. When hydraulic or mechanical actuation of the brake pads (friction) occurs, the pads are pressed into contact with the braking surface that comprises the outer surface of the disk. Friction material (pads) contacts the disc and creates interference that impedes the motion of the road wheel, thereby creating the braking action. The harder the brake pressure, the more braking power (and heat) result on the disc brake surface. Braking force is transferred from the brake pads through the disc and into the road wheel. How are Brake Rotors Made? Brake rotors are almost invariably cast from a ferrous metal, either steel or iron. Rotors may be either 'hat style,' where they fit over the wheel studs onto a hub assembly, or 'integral,' where the wheel bearings and races are part of the rotor assembly. A secondary machining process cuts a uniform mounting flange and cuts the braking surface. The braking surface is cut to be exactly parallel with the mounting flange. Rotors may be solid or a ventilated design. Ventilated rotors have a series of baffles cast in between the inner and outer friction surfaces to assist in cooling. The finished rotor is usually coated with an anti-rust chemical to prevent it from rusting or corroding during shipping and storage. Why do Brake Rotors Fail? What are Symptoms of Brake Rotor Failure? What are Implications of Brake Rotor Failure? Should the friction material become completely worn away to such degree that braking causes contact between the backing plate and the rotor, braking efficiency will be greatly reduced. A loud grinding noise during braking will likely occur and if not repaired quickly the rotor will become damaged. Rotors that are cut beyond the safety minimum thickness dimension are thin, do not have adequate structural strength and are unable to dissipate heat properly. Such a rotor can fail without warning and is not safe. 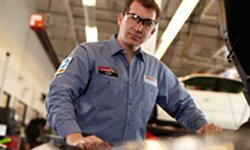 If you have questions or concerns about brake rotors, your vehicle's braking system, or any of your vehicle's components, come into your local Pep Boys where we can answer any question, help you find any part, or perform any vehicle service you might need.